And it was A-MA-ZING! We had a great time! Because it was quite a long trip, I will make 3 posts out of it, one for each destination (I don't like posts that are too long and this is already long). We arrived at LCC Terminal, took a bus to KL Sentral (about an hour, costs 7-10RM) and took the Monorail to our hostel. We stayed at Grid 9. A nice place for a good price! 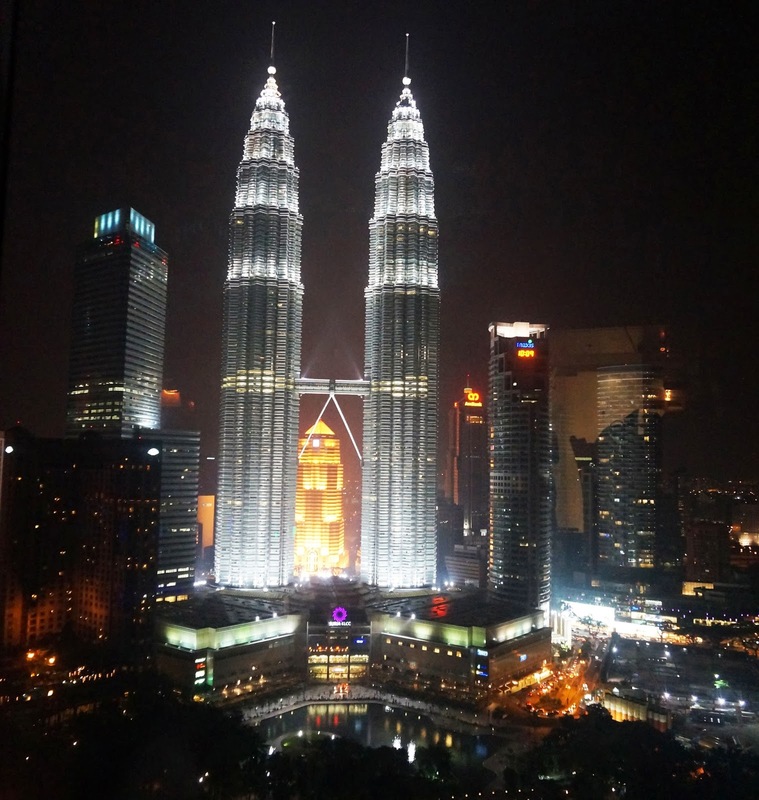 Conveniently located next to the Monorail (stop: Maharajalela, direct to Petronas Towers, KL Sentral, shopping areas,...)! We had a rest, took a shower and we were ready to explore the city! We walked around Chinatown (very close to hostel), tried some local snacks (banana cake: good; durian "stinky fruit" cake: not so good), visited some temples, passed KL's Central Market (big market with lots of small shops) and ended up in the British Colonial area. After that we decided to walk towards Little India (yes, we did a lot of walking that first day), it's a fun and buzzling place with lots of little shops and of course loooots of food! We tried some snacks again (vegetable samosa, beef and chicken kebabs, banana pancake,...) and they were all amazing! After our big walk we took the Monorail back to the hostel to relax. In the evening we went back to Chinatown and walked through the busy Petaling Street (a big market where they sell fake handbags, watches, shoes,... Like the real China). We took a right turn into Jalan Hang Lekir and sat down in this 'food court' where they served a lot of different cuisines. We had some Indian food (Tandoori chicken and a lamb curry) and Malaysian noodles. The night ended with a Dragon Dance Performance because of Chinese New year and we went back to the hostel. The second day started off with a traditional Malaysian breakfast! I had Roti Telur which is a thin bread pancake with a fried egg inside and some sauces, loved it! My boyfriend had Beef Rendang with Nasi Lemak, it's a rice dish with spiced beef, also very good. After breakfast we visited some shopping malls (they have loooots) around Imbi and Bukit Bintang. I didn't do any shopping though! I wasn't in a big shopping mood (strange! ), but that was good for my wallet, haha! After the 'window shopping' we had a drink at Toutes les Jours and jumped on the City Bus for a tour! That was nice, especially when you can sit on the deck! It was lunch time so we stopped at Little India and had some Indian food with chicken and lamb on a banana leaf. It was kinda special and you were supposed to eat it with your hands (yes the rice too) but I was really happy they gave us some cutlery. After our lunch, there was the City Bus again! 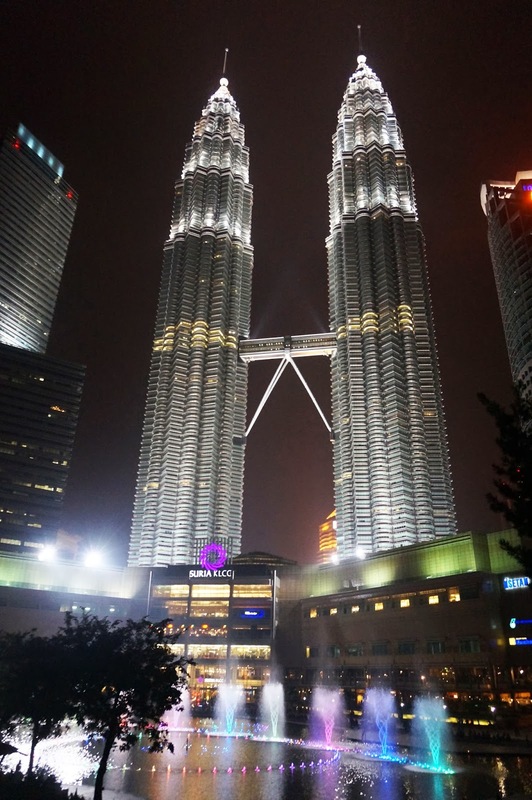 We passed by the National Palace, the Bird Park,... and we jumped off at the famous Petronas Towers, another shopping mall! I had FroYo (frozen yoghurt) for the first time! I know, it has been around for a long time but I've never tried it before! Yummy! We had a walk in the park and had some pre drinks at The Apartment, nice place with a big terrace! For dinner we went back into the shopping mall and on the 4th floor we found a Malaysian restaurant called Madam Kwan's. I thought the food was ok, not great, but good to try some new things! And then it was time to enjoy the night view from Skybar. A bar at the top of Traders Hotel and it has a pool inside! Very nice view, lovely night! Me liking the Indian food Indian curries! 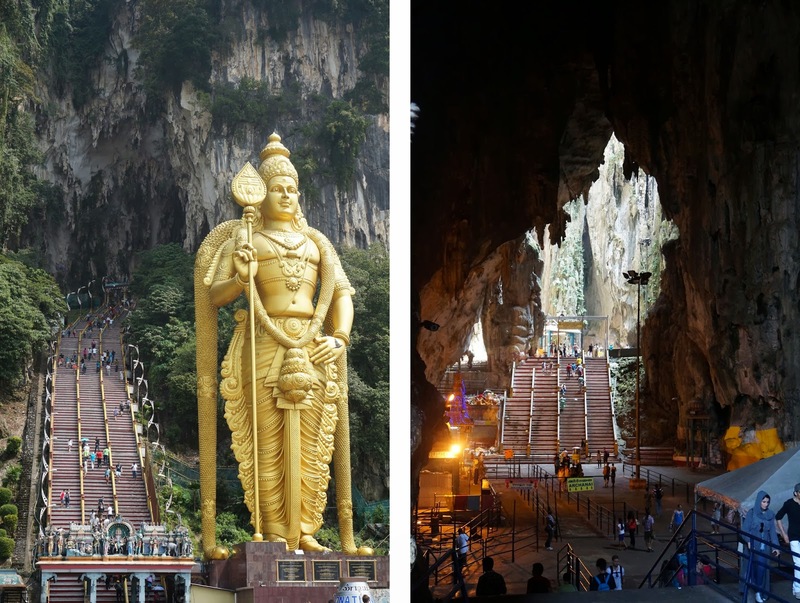 On Monday we got ready to go to the Batu Caves. From KL Sentral it's about 45min by subway. When we got out of the subway it was a mess out there! Probably the end of Thaipusam which was 2 weeks before (luckily it was over, 'cause I wasn't ready to see people like this). People were cleaning their little stalls, but the place was full of garbage and the smell wasn't good! But ok, we walked to the bottom of the caves and started climbing the 272 stairs. It wasn't that bad, just be careful for the monkeys playing around. I thought it would be a half a day activity but when we arrived at the top, their wasn't much to see anymore, so we went down and took the subway back to the city. After having some Thai food, we went to the aquarium! My boyfriend really likes doing these kind of things and once at the aquarium I also loved it! It was really beautiful! After all that walking we wanted a massage, unfortunately I didn't enjoy it at all! We found this place called Old Asia, close to Bukit Bintang, we both asked for an oil massage and my boyfriend wanted to try the ear cleaning as well (afterwards he read it's actually banned in the US and Europe, oops!). I know that Asian massages can be a little painful, but when I ask for "softer please", it's mostly fine. This girl didn't understand me I think. At some points it was really painful and she was pulling me in these weird positions. No, I didn't like it at all and felt really strange after. No more Asian massages for me! So after that not-so-nice-experience I wanted good food and we went to Hakka (very close to Raja Chulan subway), a restaurant we saw the day before and looked nice because because of their big terrace and red lanterns everywhere! They served Hakka food (from southeast China) and it was very good! We had some crispy fried chicken, black pepper beef and pork noodles! On our final day in KL we went to F.R.I.M. (Forest Research Institute of Malaysia), a rainforest. You get there by taking the subway at KL Sentral to Kepong (40min) from there you have to take a taxi. It was a really nice walk! At the beginning it's still quite easy, because there's a proper walkway, but once you wanne go up to the canopy you kinda have to climb in between the trees, how adventurous! The canopy was hanging at 30m from the forest floor and it offered a great view of the rainforest and the city! For our breakfast and lunch we found a great little Indian place close to KL Sentral! It was called Nasi Kandar Al Baik and they serve great food! It was quite a long walk and in the afternoon we went back to out hostel to relax. In the evening we went back to Chinatown for some cheap local food! So, here is where our holiday started and it will still continue, stayed tuned for what happened in Penang!